I must confess that when I picked up the Western Mail this morning and saw the headline, "Rhodri outrages Tories with mother-in-law jibe at Howard", I immediately thought of Bernard Manning. It turns out that the story is far too serious for such levity. Nevertheless, there does appear to be a bit of over-sensitivity on the part of both sides here and not a little hypocrisy. The scenario is this: Michael Howard endorses a campaign in which posters and mailshots concentrate on MRSA rates in UK hospitals as a sign of the failure of Labour to get to grips with the NHS, and in support of his policy of introducing Hattie Jacques in matron's uniform to every hospital ward. The figures quoted in almost every instance, bear no resemblance to the situation in the area in which they are used and create a misleading and exaggerated impression of the scale of the problem. Whenever, he is challenged on this issue the Tory leader refers to the death of his mother-in-law from MRSA. In addition the Tories have focussed their entire campaign on the character of the Prime Minister, accusing him of lying. Rhodri Morgan gives an interview to a political website in which he repeats everything I have just said but in very much more intemperate language. To be precise he attacks Michael Howard for "hiding behind" his mother-in-law's death from a superbug to tell lies about MRSA infections. The Tories go ballistic. Out comes Tory AMs, Jonathan Morgan and Alun Cairns to accuse the First Minister of ungentlemanly conduct. In jump Plaid Cymru to accuse him of hiding behind personal insults. Please get a grip, all of you. It was after all Michael Howard who used his late mother-in-law in this way and who started the name-calling, but that is no excuse for Labour to join in. Trust is an issue, but that is no reason to start branding Party leaders as liars. MRSA is an issue, but let us not sully the memory of a victim by using her as a political football (and that applies to both parties). If the two main parties cannot discuss the issues in a civilised way then it is no wonder people are being turned off politics. Labour's attempts to warn its wavering supporters that a vote for the Liberal Democrats could allow Michael Howard into No. 10 "by the back door" was undermined yesterday in a detailed study carried out for The Independent. The study found that a swing of 11.5 per cent from Labour voters to the Liberal Democrats could deprive Mr Blair of his overall Commons majority but it would be virtually impossible for such defections - at even twice that rate - to let in the Conservatives to form a government. Mr Blair led the co-ordinated campaign and it became a recurrent theme on many of the Labour campaign spots. However, the "Lab-to-Lib Dem swingometer" Professor Curtice devised shows that, even if there is a 9 per cent swing from Labour to the Liberal Democrats, Labour would still have an overall majority of 48. Even with a massive 15 per cent swing, Labour would still be the largest party in a hung parliament with 50 more seats than the Tories. Those figures are based on the Tories doing no better than the 33 per cent share of the vote they won in 2001, which is also in line with their current opinion poll rating. Even if the Tories improve their showing and win 36 per cent of the votes next Thursday - a three-percentage point rise at Labour's expense - and there were a 9 per cent swing from Labour to the Liberal Democrats over and above that, Labour would be the largest party in a hung parliament with 43 seats more than the Tories. The "Lab- to-Lib Dem" swing would have to be a huge 15 per cent before the Tories became the largest party - but they would be outnumbered by the combined forces of the other two parties. The study found that the Tories come nowhere near to passing the winning post of 324 seats they would need to form a government. Crucially, if enough people switched from Labour to the Liberal Democrats, Mr Kennedy's party would start to win seats instead of the Tories -so the result would be a hung parliament rather than a Tory government. In those circumstances, according to senior Labour and Liberal Democrat figures, the most likely outcome would be a deal between the two parties to keep the Tories out. "It is inconceivable that Michael Howard would be able to form a government in such circumstances. Labour's message seems to confuse the possibility of their own 'defeat' with a 'victory' for Mr Howard." So, Michael Howard comes to Wales and announces that a conservative government at Westminster would provide the cash for a council tax rebate for Welsh pensioners. His plan is that he will give the money to the Welsh Assembly Government and challenge Rhodri Morgan to implement the policy or explain to pensioners why they are losing out. Putting aside the fact that he is just tinkering with the system and failing to address the real inequality in Council Tax (a local income tax will take a large number of pensioners out of taxation altogether), the big problem with Mr. Howard's latest promise is that it is not in the Welsh Conservative manifesto. In addition, the cost of this new pledge has not been included in their manifesto costings either. The Tory economic black hole is just growing bigger. I do not suppose it is my place to comment on this but the article in today's Western Mail about dirty tricks polluting politics is interesting nevertheless. Dr Richard Wyn Jones, head of the Institute of Welsh Politics at Aberystwyth University, has alleged that dirty tricks and character assassinations have reached "unprecedented" levels in this election and the Conservatives are to blame for "leading the political debate down the drain". He accused the Tories of "coarsening debate" to the point where it threatens the "fabric of democratic life". Assembly Tory group leader Nick Bourne insisted it was Labour that was guilty of running a campaign of "smear and fear", but Welsh Labour said it had caught out the Conservatives misleading voters on asylum and rates of hospital infections. There is no doubt that the temperature of the debate this time is very much higher and that many voters are being turned off by its very personal nature. The problem is that the more political parties look to America for examples the worse it gets. Perhaps we all need to calm down a bit and concentrate on the issues instead. The Prime Minister's mantra rebounds on him as a poll in today's Independent reveals a dramatic slump in support for Labour among teachers. More than half of those who voted for the party in 2001 said they would not support it this time - with most of them switching to the Liberal Democrats. As Simon Titley also notes two separate polls published today by The Times Higher Education Supplement reveal that a majority of students and academics plan to vote Liberal Democrat as well. Support for the Liberal Democrats among teachers and students has rocketed, a new poll finds. Some 47 per cent of students have decided to back the Lib Dems, compared to 23 per cent opting for Labour and 22 per cent for the Conservatives, the Times Higher Education Supplement found. The figure is up eight points since February. Labour is down six percentage points. Among university lecturers and academics, 44 per cent said they planned to vote for the Lib Dems, double the number in 2001, the Opinion Panel Research poll found. This can only be good for us and bodes well in University seats such as Swansea West, Cardiff Central, Ceredigion and Conwy. Carl Sargeant: This is an important issue for Members on this side of the Chamber, and it is disappointing that neither the Conservative nor the Plaid Cymru delegation on health is here to question you this afternoon. I actually thought he said spokesperson rather than delegation, but the fact remained that the Plaid Cymru Health spokesperson at least had a good reason for not being there - he was a pall bearer for Gwynfor Evans. The Western Mail reports that Tory candidate David Davies has accused unnamed rivals of running a dirty tricks campaign against him in the close-run contest for Monmouth after the market town was plastered with illegal posters overnight. Apparently, scores of posters, urging voters to back Mr Davies, had been put up illegally on shop fronts, bus shelters and bins across Monmouth. David has branded it a "deliberate attempt to blacken our name". He demanded the "culprit or culprits" be found and punished but declined to say who he thought was responsible. Mr Davies said, "We condemn this sort of deliberate vandalism in the strongest possible terms. "We want to make it absolutely clear these posters have nothing whatsoever to do with the Conservative Party or our election campaign in Monmouth." The question of course is where did the perpetrators of this crime get the posters from? A LAPDANCER called Peaches stripped off for a customer who slipped £20 in her G-string - unaware he was an undercover government investigator. Julieanne Beecher earned up to £300 a week dancing for businessmen at the same time as claiming state benefits. And a DSS fraud detective was sent on a secret mission to mingle with male customers at The Fantasy Lounge. He called Peaches over to dance to give her the £20 note, but the civil servant was secretly filming the stripper's dance routine during his 40-minute visit to the club. The Western Mail reports that an unnamed big hitter is being dispatched to Blaenau Gwent to help Labour candidate, Maggie Jones, fight off the threat of Peter Law. Speculation is that it could be David Blunkett. Let us hope that he treats the regional press better than his former colleague, John Prescott. Update: The BBC report that it is indeed David Blunkett who is visiting Blaenau Gwent. On his visit he urged Welsh Assembly Member, Peter Law, to drop out of the race to become an MP in the Labour stronghold. 'Mr Blunkett said Mr Law had "made his point" by leaving Labour to fight in Blaenau Gwent as an independent.' Well, that is going to work isn't it? Big anti-climax in Plenary yesterday as an expected confrontation failed to come off. Rumours had been rife all day that Peter Law was to make an appearance to deliver a personal statement on why he left Labour. Sure enough, there he was, as large as life, sitting in his new seat on the opposition benches. However, when he stood to speak the fireworks did not happen. Instead we had a restrained and very much truncated statement that was, nevertheless, watched in silence by stoney-faced Labour AMs. I now sit here representing the people of Blaenau Gwent as an independent Member and a socialist, because the Labour Party has expelled me after 40 years of membership. Since I am now making a personal statement, it would not be appropriate for me to mention the reasons that I have already put on record publicly, neither will I here, in this Plenary, seek to attach blame to other Assembly Members, or members of another place, because I respect the protocols. I will have other opportunities to do that, hopefully when I have left this session this afternoon. That is probably the unabridged version. In the end it was just an opportunity to get on the television once more. I have commented before that it is no accident that private polls are leaked from Labour Headquarters, especially if they will help to reinforce the message being propagated by Ministers that the election is not in the bag after all. I notice, however, that they have now dropped all pretence of polls being leaked and are just releasing them to the media as a matter of course. In doing so they continue to release only those polls that will reinforce their message. This latest poll is quite intriquing as it indicates that in key marginal seats Labour are struggling to hold on against a concerted Liberal Democrat and Tory challenge. These are the seats of course, in which the opposition parties are concentrating most of their resources. I think it is unlikely that this activity will deny Labour their overall majority but it may reduce it sufficiently to at least make them moderate their behaviour and their policies. Most people would consider this a good outcome and may be encouraged to continue to vote against Labour in these marginals just to secure that greater accountability. A significantly reduced Labour majority for example could put paid to ID cards and would almost certainly prevent the Prime Minister following George Bush into another pre-emptive war, this time against Iran. The other interesting aspect of this article is the evidence from Mori on differential turnout. They now predict that 80% of Tory voters are now certain to vote, compared with 71% a week ago. Labour's comparable figure is 64%, against 66% last week. If that is correct then Labour really do have something to worry about. In many ways the increasing focus on the suitability or otherwise of candidates at the expense of a proper discussion of the issues in regrettable. However, it is right that voters need to be reassured that the people they are being asked to vote for do their duty to the community in which they live. The Western Mail's story this morning that the Tory candidate for Carmathen West and South Pembrokeshire has been living in a flat above Tenby Conservative Club, on which domestic council tax is not being paid, is of some interest. However, quite why it is news that Cherie Blair told a group of school children of her husband's aversion to computers is not clear. After all it is not as if we did not already know. For those who are fed up of seeing Tony Blair on TV each night there is now the opportunity to visualise him in a different way. These Blair playing cards feature the Prime Minister in 52 different poses. Who says that politicians try to be all things to all people? With thanks to regular comment contributor, Claire Smalley, for bringing it to my attention, this site enables you to express your politics through your underwear. Rather intriquingly the site also contains a poll indicating which parties are most popular amongst knicker-buyers. Currently, those saucy Tories are in the lead, with the open-minded Liberal Democrats in second place. Labour, who appear to be having problems covering up their inadequacies in the underwear stakes, are trailing in fourth. This is one on-line poll that will be difficult to hi-jack. It’s been fun, but I am left wondering why more politicians are not blogging. Even with the research, each entry took only a few minutes. Asked by this newspaper about my site, the real AC said he had "better things to do than worry about blogs". But with millions of people reading blogs every day, are they not exactly what he should be worrying about? Maybe if my local candidates spent the odd moment trying to engage me and keep me up do date, then I might make the effort to get to a polling station on May 5 and put my cross in a box for the very first time. Who knows, it might even be for TB’s lot. Last night's Doctor Who was fascinating if only for its political allegory - a British Prime Minister urging the World to focus its nuclear arsenal on imaginary weapons of mass destruction, and so close to a General Election as well - priceless! As if on cue today's newspapers have focussed on Iraq, with the publication of government legal advice, cautioning that the invasion could be illegal. The leaked document appears to confirm for the first time that the Attorney General, Lord Goldsmith, had serious reservations about the legality of the conflict, only to change his mind as British and US troops massed on the border of Iraq ready to invade. With rumours that America and its British ally are now planning an attack on Iran, this is a crucial piece of evidence that will focus attention on the Prime Minister and the reasons he gave for going to war in the first place. It seems quite clear now that not only was that decision based on a false premise, as we have said all along, but that the Government was also advised that it could be illegal. The Prime Minister's latest argument, that the war achieved its purpose of getting rid of an unelected dictator, does not stand up to scrutiny. That may have been the outcome, but it was never used as the reason for the war, nor does it have any moral authority. After all if it is our duty to go to war to dispose of unscrupulous dictators as Blair implies, then why have we not launched an invasion of Zimbabwe or North Korea? The fact is that international law is in place to stop powerful countries from unduly attacking others, no matter how obnoxious their regime and vice versa. If we flout that law then we are no better than them. With great power comes responsibility. The judgement that the British people will be asked to make on 5th May is whether the British Prime Minister exerised his duties with responsibility and within the law. How this document will bear on the outcome of that election can only be guessed at, but the one thing that can be predicted is that with its publication, the war on Iraq will be the main subject of debate for the next few days. It has been bothering me for days. My wife received a Labour Party election communication earlier this week, which I have of course read from cover to cover. And yet something is not quite right. This morning I realised - there is not a single photograph or mention of the Prime Minister on it. Are they ashamed of him? We should be told. A search of the electoral register for Swansea East finds nobody called Martin or Sian Catherine James eligible to vote in this General Election in this constituency. What is going on? Update: As an exercise in measuring the sensitivity of the Labour Party to criticism (and it wasn't), this post has proved very enlightening. Within minutes of it going on-line there was a comment from a local Labour activist, followed by a telephone call and an e-mail from Sian James herself. Clearly, they are monitoring my every word. This over-sensitivity is interesting given the way that Labour are able to get viciously personal themselves. In the final week of the local Council elections last year they delivered a highly personal, misleading and inaccurate attack on me to every home in the Parc Gwernfadog area of Morriston, despite the fact that I was not a candidate there. I have already catalogued on numerous occasions the way that Labour distort the truth to attack Liberal Democrats or as in the case of ASBOs and other policies, just tell outright lies for political advantage. Nevertheless, this post was not meant to be a personal attack on Sian James, just a simple public enquiry so as to clarify a point in her election literature. I am happy to report therefore that she and her family are living in Caemawr Rd, Morriston. They purchased the property and moved-in in January 2005. Sian says "we therefore registered immediately with the local authority as residents. We have also registered for our bank accounts, utility accounts, trade union membership, etc. It is OUR family home - it is where I and my husband (and cat reside.) Our children are adults and left home several years ago." If they registered to vote in January then they have been unfortunate, as the Council has failed to get them onto the register in time to vote in Swansea in this General Election. Still full marks for having a cat! I now look forward to them re-issuing the election address with pictures of the Prime Minister on it. For some reason the Tories do not learn their lesson when they score own goals. As this article makes clear they are still sending out letters quoting inaccurate and exaggerated MRSA rates for local hospitals. Could it be that they don't care that they are misleading the public as long as they are stirring up controversy and getting their point across? After politics and cats my next favourite subject is the wonderful West Wales town of Laugharne. The Western Mail this morning carries a full page article on how tourists are flocking there not to pay homage to Dylan Thomas but to seek out Neil Morrissey. It is true that Mr. Morrissey owns three interesting venues in the town, namely Hirst House, the Three Mariners and Brown's Hotel, but there is a large number of other places to visit as well including the castle, the boat house, the beautiful coastline and quite a few top class restaurants, shops, pubs and a fantastic little silversmith's complete with a cat that sleeps amongst the exhibits. That more and more people are finding the town is to be welcomed. However, if they are to capitalise on the interest the local burghers really need to sort out their internet presence and try to be more accommodating to visitors. The last time I was there, shortly after Easter, the Boat House was still on winter closing times, leaving a stream of visitors staring at the garden in the sunshine, but unable to access the experience within. The Labour campaign to hold onto Cardiff Central is fading away with its candidate, Jon Owen Jones, effectively being left to his own devices by headquarters the Western Mail reports today. They state that Labour insiders privately admit that they have all but written off Mr Owen Jones' chances of hanging on, and he is largely running his own campaign, which would not be happening if the party thought he had a realistic chance of holding the seat. That does not seem to deter Mr. Owen Jones, who has come out fighting this morning with a stream of consciousness rant filled with largely inaccurate invective. He claims that the Liberal Democrats voted against Anti-Social Behaviour Orders. He is wrong. The Liberal Democrats in fact voted for the 1998 Crime and Disorder Act. He also joins the far right wing parties in criticising the Liberal Democrats for allegedly wanting to pay benefits to failed asylum seekers. What our manifesto actually says is that "we will work within the EU to develop common standards so that all EU countries take their fair share of refugees. We will also end asylum-seekers' dependence on benefits, allowing them to work so they can pay their own way and use their skills to benefit everyone." The benefits we are trying to protect are for the children of failed asylum seekers awaiting deportation. Taking these benefits away will mean many young children are separated from their parents and put into care, adding massively to the cost to the state. Would Mr. Owen Jones would rather see these children begging on the streets? Finally, he criticises our opposition to ID cards by claiming that they will ensure that state benefits will only go to people who are entitled to them. There is no evidence of course that ID cards will even be effective in achieving this, but if Mr. Owen Jones is insisting that they act as a passport for people to access public services then he is more off-the-wall than I had suspected. Such a policy will rapidly lead to a situation whereby the card is voluntary for most of the articulate middle classes and compulsory for those who use public services and/or cannot argue and resist the need for the card. If Mr. Owen Jones is prepared to advocate such social injustice then the sooner he is an ex-MP the better. In political terms a black hole is a constituency where a party has very few members, little, if any activity and even less chance of winning. For the Institute of Fiscal Studies black holes are what they find in the cost of delivering the various manifestos. After two weeks of campaigning in which Mr Brown has attacked the Conservatives for their claim to be able to raise spending on health and education, cut taxes by £4bn and cut borrowing by £8bn, the IFS said Mr Letwin's sums did add up - but only if he could find the £35bn of savings proposed by the review conducted by the businessman David James. But the IFS was not convinced that Mr Letwin would be able to deliver the promised spending cuts. The Tory plans, it said, assumed that they would be "able to cut spending as quickly and painlessly as they claim. Past experience suggests caution". If the Conservatives were unable to find their projected savings, they would face the choice of "spending and borrowing more than they intend or making other, potentially more painful, spending cuts to fill the gap". The Institute also question the Liberal Democrats' costings of their manifesto suggesting that we might struggle to raise £4.8bn a year from their proposed 49p top rate of tax on those earning more than £100,000 a year, because the better-off would find ways of paying less tax. Our Treasury spokesperson, Vince Cable, refutes this claim of course. He states that the Liberal Democrats' manifesto is fully costed, using Treasury figures where they are available. I have seen the costings and there is a substantial reserve built into them to cater for any decline in tax revenues. Still the IFS conclusion that whoever takes office after the election, the tax burden is likely to be higher at the end of the next parliament than it is at the end of this one, is worth pondering on. English Local Government Minister, Nick Raynsford, cannot be very popular with the Wales Labour Party. That is because his intervention on Council Tax yesterday has undermined their entire General Election campaign. Until now the Labour position on rebanding in Wales was quite straightforward. They argued that it was necessary, that it was fiscally neutral and that responsibility for the subsequent Council tax bills rested entirely with local Government. Admittedly, they floundered a bit in places like Cardiff where two thirds of householders face increased payments of £100 plus, despite the fact that the local authority has cut the Council Tax, but they tended to gloss over that and hope that nobody would notice. Thanks to Mr. Raynsford this is no longer possible. Mr Raynsford told the Guardian that the government is still committed to a fairer system which does not increase the cash yield from council tax, the remit of the Lyons inquiry. Not introducing a higher band, which would almost certainly push up receipts, is the "logical conclusion" of his promise that the English revaluation will be "revenue neutral", he insists. His emphasis in these remarks was on the fact that Council Tax rebanding should be revenue neutral, which it has not been in Wales, and he ruled out a new higher band because he believes that this has pushed up Welsh Council Tax bills. In other words he explicitly blamed the Labour Assembly Government's rebanding exercise for increasing Council Tax bills by an average of 9% here. What is worse from the point of view of English taxpayers is how little he seems to understand what actually happened in Wales. It is, of course, impossible for a rebanding exercise to avoid having winners and losers. The key to acceptance lies in how many losers and by how much they will lose. That is where the Welsh Assembly Government have got their exercise so wrong. Secondly, Mr. Raynsford seems to believe that all the fuss in Wales is over the fact that an additional band has been created for the most expensive properties. Er...no! The biggest losers in this rebanding exercise have been taxpayers with modest incomes living in band A, B and C houses. Large numbers of these properties in Cardiff and elsewhere have been moved up one band or more because of the buoyant property market. As I have argued before, if you have a property tax then frequent revaluation must be a feature of it. That is why, when we were in Government, we argued that the Assembly should be pushing for a local income tax instead. Mr. Raynsford may be trying to spin that revaluation as somehow harmless but it is inevitable that no matter how much they water it down there will be substantial numbers of people facing higher bills in England regardless of their income. It is that essential unfairness that is the main reason why Council Tax should be replaced by a local income tax. And look at this! It seems that the massed Labour ranks are breaking formation even more on this very issue. If, as Junior transport minister Charlotte Atkins has said, Labour is planning to scrap Council tax "because it was regressive", then what is all the fuss about? Do they have a hidden agenda after all to accept Liberal Democrats plans for a local income tax once the election is over? She has apologised and retracted, so maybe not. But sometimes these gaffs are more revealing about hidden intentions than they are about political disunity. Mark Choueke - How did you and your cabinet colleagues react to Peter Law's decision to quit the party after 35 years service to Blaenau Gwent as a Labour politician? John Prescott - It didn't even register with us. The voters just have one choice, vote Labour otherwise they'll end up with a Tory government. It's unfortunate that some of our decisions upset some people. MC - But this isn't about upsetting Peter Law, it's about upsetting the many thousands of Labour voters in Blaenau Gwent who helped you form a strong government - they feel alienated. JP - Why are you asking me about this, I don't care, it's a Welsh situation, I'm a national politician. MC - Are you too big to care about the Labour voters in Blaenau Gwent? Do you think there may be something in your party's methods of working that require a rethink when a politician chooses to stand against you after 35 years service to Labour? JP (walking away) - Where do they get these amateurs from? You're an amateur mate, go get on your bus, go home. MC - Are you too big for the regional Press now John? JP - Bugger off - get on your bus you amateur. MC - (Following deputy prime minister) Is my interview over John? Because if that's all you've got to say, that's what will go in the paper. JP (turns aggressively back to reporter) - Ooohh, I'm scared, go ahead, put it in your paper. MC - I hoped to hear what the deputy prime minister had to say about it. JP (now ignoring reporter) - I've never seen a school in such a lovely setting. For some reason Captain Beany is not standing in his native Aberavon this time but in Cardiff Central. A postcard is now being circulated to homes therefore with a picture of the caped crusader on a tin of beans. The front of the card contains the legend "Vote for the one politician you can trust. He does what it says on the tin." He will still make Baked Beans quality chceks on your behalf every day. Thanks to him Beans on Toast will still be available in Cardiff cafes. and a vote for the New Millennium Bean Party will mean the future's still orange. So please...don't be a meany (we've asked very nicely) vote Beany. He does what it says on the tin." Update: The leaflet can be seen here. Halfway into the campaign and there were quite a few seats vacant on the opposition benches in Plenary yesterday. At least one of the three Tory Parliamentary candidates, David Davies, made an appearance but there was no sign of the other three. To be fair to David, he did not just come along to be counted. He made a contribution in First Minister's question time and spoke on school dinners. He has given his apologies for Education Committee this morning however. The first thing we noticed on entering the chamber was that a new seating plan had been circulated. Although he was not present, for obvious health reasons, Peter Law has now been removed from the Labour benches and plonked in the back row on the opposition side behind a pillar. This is not a deliberate slight. The seat that Peter will occupy when he returns is that used by the Presiding Officer on the very rare times he joins in a Plenary debate. Dafydd Elis-Thomas will now sit in Peter Law's old seat if and when he decides that he needs to participate in a discussion. As if to twist the knife into Wales Labour this morning the Western Mail highlighted the fact that dozens of Labour activists in Blaenau Gwent are facing expulsion for supporting Peter Law's campaign. Eighteen of them have been listed as supporters on Peter's election literature. Amongst these people are four former Mayoresses and some very long serving Councillors. The article illustrates better than anything I can say how deep the divisions run in this Labour stronghold and how, when comrades fall out, they do so with vigour. I thought it was worth recording here how the Welsh Assembly is once more breaking new ground with its use of the internet to consult formally on policy reviews. As far as I am aware we are the only British Parliamentary body using the web in this way. The Education and Lifelong Learning Committee, which I chair, has set the ball rolling with an on-line consultation in relation to its review of Special Educational Needs and the statementing process. Come and have a look here and if you are interested in this subject or have a contribution to make then please participate. The Guardian reports this morning that the long predicted panic in Tory ranks as their poll ratings tumble is coming to pass. Mr Howard's attempts to divert reporters' attention onto his plans to crackdown on "yobs" and binge drinking were frustrated, they say, by repeated questions on Tory disunity, the party's dismal poll ratings and the media mogul Rupert Murdoch's opposition to his immigration plans. A trio of opinion polls published today show the Tories trailing Labour by between five and 10 percentage points. The Financial Times/Mori poll is the worse for the Tories, predicting a Labour majority of about 138 seats. Meanwhile the FT also reports that Mr Murdoch, whose company owns the Times, Sunday Times, Sun and News of the World, criticised Mr Howard's promise to put a cap on the number of immigrants allowed into Britain a year at a media conference in Los Angeles. Labour's lengthening poll lead has caused senior Tories to wobble over Mr Howard's "dog-whistle" electoral strategy and warn the Tory leader against appearing to be a single-issue party. The question now must be whether Michael Howard and his election team can adjust their strategy to reverse the Tories stagnating poll ratings? If he has not done so by next weekend then backroom mumblings may start to turn into a more substantial revolt. The media this morning went big on the Peter Law story. Radio Wales in particular had Peter on to justify his decision to stand against Maggie Jones, the official Labour Candidate. They then followed this with an interview with Welsh Office Minister, Don Touhig. Don was his usual upbeat and bombastic self, confident that Labour will triumph against this renewed threat in Blaenau Gwent. He might have been more convincing however, if he had got his candidate's name right first time. Instead, he started extolling the virtues of Maggie Smith before quickly correcting himself. Despite promising in their manifesto that they will reduce hospital waiting times in Wales it seems that Labour are not prepared to tell us how they will do this until after the General Election is over. Presumably they want us to trust them to deliver. They asked us to trust them in 1997 as well, when they set specific targets for waiting lists which they then failed to meet. They asked us to trust them over war in Iraq, only to have the words thrown back in their faces when the alleged weapons of mass destruction proved not to exist. Trust is not something that voters are prepared to offer Labour anymore. Indeed, if the reaction I encountered on the doorsteps of Neath tonight is anything to go by, many of Labour's most loyal voters are deserting them over precisely this issue. As if to add to the woes of Wales Labour, rebel AM Peter Law has finally announced that he will stand as an Independent in Blaenau Gwent after all. I have already commented on the impact his decision will have on Labour's majority in the Assembly. The question now is what will happen to their majority in Blaenau Gwent? The Western Mail reports this morning that a lecturer at the University of Swansea has resigned as an examination officer because of the difficult position he has been put in following the continued suspension of Colwyn Williamson from the Philosophy Department there. Mike Cohen, examinations officer for philosophy students, has handed in his resignation, citing a lack of faith in the exams procedure. His philosophy lecturer colleague, Colwyn Williamson, a strong critic of plans to cut philosophy and other "unpopular" courses at the seaside campus, has been suspended for more than a month. Students on the philosophy course, which is now drawing to a close, have issued a law suit against the university, claiming the suspension and uncertainty over the planned cuts has damaged their education. In a letter to the university, Mr Cohen wrote, "My continuing as examinations officer would be to implicate me in the pretence that the university has taken all reasonable steps to make adequate provision for the welfare of its students." The University's reaction has been to warn him that his resignation may be in breach of contract and that they might force him to continue in his position. Not the most diplomatic solution in the circumstances. The continuing crisis over the UIniversity's decision to close this and other departments continues to haunt them. A number of philosophy students are taking the college to court, alleging breach of contract and negligence, in addition a student and at least one member of staff has allegedly been threatened with disciplinary proceedings as detailed here. What is going on and why is this issue being allowed to drag out in this way? Update: The South Wales Evening Post reports tonight that members of the Association of University Teachers have given the go-ahead for a ballot on industrial action over the ongoing row surrounding the philosophy department. At a packed meeting of the AUT's Swansea branch last week, Barry Johnson, assistant general secretary of the national union, told members he was concerned at the threats being made of disciplinary action against individual AUT officers. Members also condemned any threats of disciplinary action against Michael Cohen, who has resigned as the philosophy department's examinations officer on the grounds that the provision made by the university for the welfare of students in the coming examinations is not adequate. Perhaps some new tactics are needed from the College authorities. It is possible that the story of the next week will be that of the failure of the Conservatives to make any in-roads into the Labour lead, their declining support and hopefully, the steady advances in the polls being made by the Liberal Democrats. Certainly, that is the story of the weekend polls. In the Sunday Times, the Yougov poll gives Labour a 1% lead. Their vote is down 1%, the Tories are unchanged and the Liberal Democrats are up two to 23%, their highest ever poll rating during a General Election campaign. The experts predict that this would give Labour a majority of 60. The ICM poll in the Sunday Telegraph also has the Liberal Democrats up two to 22%, the Tories have fallen four points to 30% and Labour are up two to 40%. Communicate Research in the Independent on Sunday has Labour on 40%, Tories on 34% and the Liberal Democrats on 20%. The Tories promise tax cuts, which they say they can afford by cutting bureaucracy, and some of their giveaways are pegged to tangible savings elsewhere. But some are simply unexplained: 20,000 new prison places created, similarly a tenfold increase in drug rehab places, paying people's private-health bills and school fees. How? The manifesto exudes frustration, which it claims to feel on behalf of the British people, but which, instead, reflects the party's own crisis. Having ceded the middle ground to New Labour, the Tories now advocate radical change by targeting scapegoats: immigration, 'political correctness', Brussels bureaucrats. This is the politics of anti-politics - the 'us against the system' rhetoric of the fringes. It wilfully ignores the complexity of government, which suggests that the Conservative party does not seriously expect to be in government. In which case, Mr Howard has his work cut out explaining why we should vote for him. This is still going to be an election that will be determined by differential turnout. There is no doubt that the Tories are motivating their core vote. However, if they continue to slip up in the polls then even those loyal voters will begin to question Howard's leadership and his ability to win. In those circumstances then they too might consider it not worth the effort of going to the polling booth. From the Who is Doctor Who? site. Tasteless, but absolutely priceless nevertheless. The NHS Confederation, representing health trusts across Britain, abandoned an attempt to stay out of politics during the election when its leaders became outraged by a letter to voters from the Conservative leader. Mr Howard attacked the Labour record on infection control and, to underline the point, gave figures showing "the number of people who contracted MRSA in your local NHS trust". Each letter included figures for the recipient's constituency. The confederation found that the statistics bore no relation to the number of infections in the nearest NHS trust. Other independent bodies have voiced dismay about election claims concerning Gypsies, crime and immigration - not least the doctored anti-immigration photo of the Tory candidate in South Dorset, Labour's tightest marginal seat. What is also interesting is the way that opinion polls are shaping up. All this week's major opinion polls showed the Tories starting to slip back to where William Hague failed in 2001. The YouGov poll for the Daily Telegraph, which had the main parties neck and neck on 36% a week ago, saw the gap widen to 38%-33% with the Lib Dems up from 20% to 22% at the Tories' expense. The newspaper concluded that populist tactics have run into the buffers. One senior Tory told the Guardian last night: "We have flogged this to death. It underpins a narrow base, but does not get us much further." Things are starting to get interesting after all. Once more Welsh politics and the Wales Labour Party in particular, have been shaken out of their comfort zone. For some time we had all expected a challenge by Labour Assembly Member, Peter Law, against his own party in Blaenau Gwent. It was likely that this could have led to the loss of Labour's safest seat. However, Peter Law withdrew, due to being diagnosed with a brain tumour. Having announced that Peter had effectively expelled himself from the party by his declaration of candidacy, Labour hastily withdrew that threat. It now transpires that not only does Peter consider himself to be no longer a member of the Labour Party but he is feeling well enough to consider standing again. Whether Peter puts a nomination form in to become an independent candidate before 4pm on Tuesday is something we can only wait to see, but his formal separation from Labour does have much wider implications for the Assembly itself. It means that Labour no longer have a majority with which to govern. In retrospect I now cannot help wondering what it was that was discussed when the Deputy Presiding Officer and Forward Wales AM, John Marek, phoned Peter Law on Tuesday. John Marek is, of course, another refugee from Welsh Labour hegemony. He was expelled after standing as an independent in Wrexham and went on to win it from Labour. He formed his own party and is rumoured to be interested in facilitating a coalition to remove Labour from power. Will Peter Law now join Forward Wales? If he does he may have to start wearing the uniform already made famous by the Party's leader and sole AM - open top sandals with socks. The impact on the Assembly itself will not become apparent for some months. Firstly, Peter Law himself needs to fully recover and resume his seat. There is also the added complication that he might actually find himself to be an MP after 5th May. Secondly, I understand that Plaid Cymru AM, Leanne Wood, will be on maternity leave until after the summer recess, though that will not stop her appearance at key votes. Thirdly, three Tory AMs are currently campaigning in the General Election and are not attending Assembly meetings. If one of them were to be elected then that would also have an impact on the arithmetic. The odds are that Labour will stay in Government but without a majority. They would not enjoy that in any way whatsoever. At any stage they would be subject to being ambushed by the opposition and they could never be certain of getting any policy through Plenary. The first test will be the debate on the Rees Commission report on student finance. Could this new scenario lead to there being no top-up fees in Wales? Labour may respond to this new situation by seeking a coalition with another party, possibly the Welsh Liberal Democrats. The fact that they have burnt their boats so effectively in the last two years will make it very difficult for any party to respond positively to such overtures. Equally, there is strong resistance amongst a number of AMs in both Plaid Cymru and the Welsh Liberal Democrats Groups to any grand coalition involving the Conservatives. How things will play out is difficult to forecast. What is important is that all parties use the opportunity constructively. We cannot allow the Assembly to lose further esteem with the general public. Having previously had a debate over what theme tune the various political parties should adopt we now have the Guardian exploring the musical tastes of our politicians. Charles Kennedy confesses to listening to David Bowie and folk music, George Galloway compares Bob Dylan to Shakespeare whilst Oliver Letwin confesses that he has never really listened to pop music. Lembit Opik praises Elvis Costello, folk music and the Beautiful South. Writing as someone who currently has Guns and Roses in my car CD player, you can see that there is room for all kinds of people in the Liberal Democrats, though I have also been known to listen to Elvis Costello and David Bowie as well. What all politicians should be able to agree on however, is that all copies of Lembit's 'truly awful Christmas single' should be buried for eternity, along with David Steel's 'I am feeling Liberal'. Dayglo orange....dazzles drivers whilst going past and full of artificial preservatives. Have a habit of springing up like ragwort, hence difficult to eradicate and not environmentally friendly. Clearly, we will have to have a re-think.....not! As predicted there was much talk in the chamber around the politics of the General Election. We all wanted a piece of the Tories. What was noticeable was the absence from the Assembly of the three Conservative AMs who are fighting Parliamentary Constituencies on 5th May. Alun Cairns (Vale of Glamorgan), Jonathan Morgan (Cardiff North) and David Davies (Monmouth) were nowhere to be seen. Peter Black: We have heard a lot about waste in speeches made by Conservative Members. Do you think that one waste of public money that we could do away with straight away is paying three Assembly Members to campaign for the general election, when they should be in this Plenary meeting? Nick Bourne: We have already heard from the Liberal Democrats regarding the need— [Assembly Members: ‘Answer the question.’] I am about to. We have already heard from the Liberal Democrats on the need to prevent shameless populism, and I am all in favour of that. However, if you do not believe that there is a general election going on, then I am surprised that we have heard mention of Sedgefield and Dorset South, which, when I last looked in my atlas, were not parts of Wales. The Deputy Presiding Officer: Order. You need to refer to the motion. Leighton Andrews: If you allow me to proceed, Deputy Presiding Officer, you will see that I am. Do you agree with your candidate for Monmouth, who said that we need a world—class health service, but that if you look around the world at the better health services, they are not provided using an NHS—type model? We will have to see if the three Tories grace us with their presence next week. The First Minister: Nutritional standards in Welsh school meals were praised by Jamie Oliver. I was extremely pleased to hear him say that the standard of school meals in some local authority areas in Wales—he may not have meant all parts of Wales—was good. He picked out for particular praise the two west Wales authorities of Carmarthenshire and Pembrokeshire. Scotland has gone down the route of regulating what you can include in school meals, such as reducing salt, fat, monosodium glutamate and sugar. We have tended to concentrate on adopting an holistic approach to the provision of school meals by trying to persuade schools not only to serve healthy food, but to do so in such a way that means the children will eat it. We all know the problem with teenagers—if you tell them to eat a raw carrot, they will want greasy hamburgers. However, getting them to eat well is not as easy as telling them to eat greasy hamburgers, because they will still not necessarily want a raw carrot. Somehow, we must induce teenagers, in particular, to accept what is on offer as a healthy diet that they want to eat; Wales is leading on such an approach. The First Minister: What is spent on school dinners will depend in the first place on whether we are talking about free school dinners or those that are paid for. We are trying to persuade authorities in Wales to increase their expenditure on the content, and make sure that it is healthy content, but also to present the food in such a way that kids will eat it. Merely serving healthy food does not ensure that kids, especially teenagers, will accept it and realise that it is important for them to eat it, because teenagers go through a phase where they want to do the exact opposite of what those in authority wish them and tell them to do. It is not as easy as reversing the situation and forcing greasy hamburgers on them to make them choose to eat a raw carrot instead. It is not as easy as that, and we know it. We have to try to persuade people to try the healthy options, because it will be good for them. Plaid Cymru member, Helen Mary Jones, summed up what we were all thinking. How come Rhodri knows so much about child psychology? Helen Mary Jones: I am sure that you would agree that one major potential market for local produce is local schools. As you have mentioned several times today, Carmarthenshire is a good example of where competition rules issues have been overcome. I was interested in some of your earlier responses, and your forays into child psychology have been fascinating. However, I press you again to commit to match the increased funding for school meals promised to schools in England by the Westminster Government—and I will not credit that to Jamie Oliver, or anyone else necessarily—to enable schools across Wales to provide more locally sourced food. OK, the headline is not entirely fair but I cannot help but wonder why, after having offered a telephone interview to the Western Mail, Home Secretary, Charles Clarke, failed to deliver. The Western Mail reports that the about-turn occurred after Labour officials sought details of the subjects that Mr. Clarke was going to be questioned on. After being told that the newspaper wanted to ask about identity cards, detention of terror suspects without trial, asylum, immigration and student top-up fees, which Mr. Clarke was responsible for introducing, the Home Secretary failed to keep his promise to phone them back. How strange. It is not just the UK Government who are complacent about the dangers of fraud in the postal voting process. The Welsh First Minister is also determined to play down the dangers. In the Assembly yesterday he asserted that "there is no evidence of any large-scale postal voting fraud in Wales." He may be right but there was no evidence in Birmingham either until John Hemming forced the matter into an election court. Rhodri has, of course, missed the point. It is not the obvious presence of fraud that calls for action but the fact that the system is flawed, that fraud is relatively easy to perpetrate and that it has happened elsewhere. There need to be reforms to stop this happening again, in Wales or elsewhere. In the meantime, John Hemming has unearthed another scandal around the use of postal votes in Birmingham in the last local Council elections - hundreds of unopened and uncounted postal votes from the 2004 local elections locked away in a small room in Birmingham Town Hall. Liberal Democrat MEP, Chris Davies is absolutely right when he says that the current system of allowances for members of the European Parliament is "tantamount to embezzlement". British MEPs of all parties overwhelmingly voted for reform but were outgunned by a combination of Christian Democrats and socialists, together with poorly paid MEPs from new EU countries. Some of the reforms they proposed include fines and suspension for gross financial irregularities. The Guardian notes that Welsh Labour MEP, Eluned Morgan, voted against some of these, whilst Robert Kilroy-Silk, the former UKIP member, abstained. Chris Davies reports that "Some shout that it's beneath the dignity of a parliamentarian to keep receipts or have a public scrutiny of their spending." If this is the case then it is a disgrace. All expense claims in the Welsh Assembly need to be backed up with receipts and a declaration that they have been wholly incurred in pursuance of the business of being an Assembly Member. This is a system that should apply in all Parliaments. I understand that the lack of a common salary for MEPs of all Countries means that some rely on these expenses to top up their earnings, but that is not a defensible reason for opposing reform. Reform must include a common salary and a reining in of unsupported and indefensible expenses. This is something that individual Governments should be pushing for as well. "Clearly what the general election should produce is more Liberal MPs and less Labour"
Of course the Conservatives are using every known trick to get their message on immigration across to the electorate. Their hypocrisy on this subject however was exposed by The Times this morning with a before and after photo of the Tory candidate for Dorset South with former Home Office Minister, Ann Widdicombe. In the first picture, the Tory candidate, Ed Matts, stands in front of a crowd and is holding a photograph of the family of a deported asylum seeker. 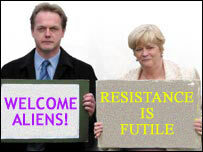 Ann Widdecombe displays a placard saying: “Let them stay”. The second image is from Mr Matts’s election literature. The crowd has disappeared and the words are changed. Mr Matt's photograph is now a placard calling for 'controlled immigration', Miss Widdicombe is now calling for 'not chaos and inhumanity'. The Reverend Aled Edwards, who chairs the Welsh Refugee Council, really hit the nail on the head yesterday with regards to Tory immigration policies. He was quoted by the Western Mail as saying "the Conservative leader should accept responsibility for criticisms made last year in a report by the Commons' Home Affairs Select Committee. The report said the computer system was introduced 18 months late and by April 1997, there were 54,000 asylum applications awaiting an initial decision." He went on: "Experience dictates that throwing populist headlines at complicated humanitarian problems rarely makes sense and, when they don't work, frequently demands expensive remedies at the taxpayers' expense. 'Proposals (by the Conservatives) to withdraw from the 1951 Refugee Convention and replace the fundamental right to seek asylum with a 'quota' for refugees are alarming and dangerous. Even for a modern Anne Frank arriving in the UK, seeking safety from persecution, the experience under this policy would be nothing other than repugnant." "On arrival in the UK, she would be deprived of the protection currently offered by the UN Convention, the pertinent Human Rights legislation and presumably, the UK's child protection policies. She would presumably be taken from our shores to a camp in another country. To date, no country has been specified. Once there, even if she is deemed to be a genuine refugee, there will be no guaranteed entry into the UK." The reference to Ann Frank is a particularly apt one. Under a Conservative regime she would be mistreated and possibly even sent back to her death. Is this anyway for a civilised country to behave? 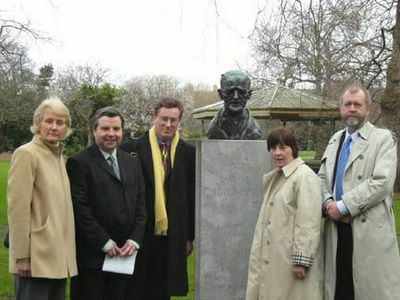 The Welsh Assembly's Smoking in Public Places Committee pay homage to James Joyce whilst on a fact finding trip to Ireland last February. From left to right: Jane Westlake, Committee Clerk, Dai Lloyd AM, Peter Black AM, Val Lloyd AM and Jeff Cuthbert AM. So would Joyce have approved of the smoking ban? I think not. That Michael Howard has played the race card so early and invoked the spectre of immigration is no surprise. At the moment the Tories are prepared to jump on any popularist bandwagon if it attracts votes and gets people talking about them. Their problem however is twofold. Firstly, that this policy is unworkable, because the imposition of a strict quota may well lead to Britain being in breach of international treaty obligations as it turns away genuine victims of oppression. Secondly, that Howard's own record as Home Secretary does not stand up to scrutiny. Mr Howard's third charge was Mr Blair's failure to get a grip on asylum and "pussyfoot around" on immigration. This completely ignores the coercive controls that Labour has introduced, cutting asylum applications by two-thirds since October 2002, with 1,000 cases a day being denied entry by 2003. His first innuendo was that "for too many years immigration has been a no-go area for political debate". He must know this is an absurd assertion. Last year's asylum and immigration bill was the fifth in a decade to be debated at length in parliament. Few areas of social policy have received more debate. He went on to speak about the "chaos" in the present systems. There are many ways in which they could be improved, but compared to the system when he was in charge as home secretary (1992-97), asylum is transformed. Average asylum applications now take two months to complete instead of 20 months. The tens of thousands of applicants left in limbo by Mr Howard in his period prompted the UN high commissioner for refugees to describe the UK system as the worst in Europe. And what is the real picture with regards to immigration in Britain? Just two days before Mr Howard spoke, the UNHCR's representative in Britain, Anne Dawson-Shepherd, spoke of her agency's concern over "the crisis rhetoric" being used in the UK election "often fuelled by thinly disguised xenophobia and political opportunism". She went on: "The number of people claiming asylum in the UK has dropped 61% over the last two years, back to levels not seen since the early 1990s." She wrote a personal letter to all parliamentary candidates asking them to "show political leadership and social responsibility by working towards reversing the atmosphere of intolerance that has been fostered towards refugees and asylum seekers." She spoke of their vulnerability and need of help and support. A civilised appeal, brutally ignored by Mr Howard yesterday. The most wounding attack on Michael Howard however comes not from the other parties or even from newspapers of the left-leaning intelligentsia, but from a former Tory immigration minister. Charles Wardle stood before a Labour press conference and said that "it almost defies belief that Mr Howard is standing before people and presenting this as a policy proposal. It is the most half baked, incoherent package imaginable. It shows he is utterly unsuited for the for the position of prime minister." He told reporters that Mr Howard's policies are "uncosted, unworkable and likely to make immigration and asylum problems worse not better." Nick Barlow and friends have set up a new blog with the objective of rounding up General Election coverage on blogs as well as providing links to the latest news and developments. It is called 2005 UK General Election and is well worth a daily visit. Meanwhile, my post on Mugabe and Candid Camera has featured in Tim Worstall's Britblog Round-up number 8. Another blog of interest is the one now being run from the Charles Kennedy campaign bus. I have linked to it on my blogroll. We will see how it develops and what insights, if any, will be offered on the Leader's campaign. When I was a student I would often approach an essay with an idea of what I was going to say, write it, work through the argument and the facts logically and then find that I had come to a completely different conclusion altogether. Perhaps that is why I did not make a career as an academic. Having read Nick Cohen's Observer column today it seems that he had the same problem except that he left his original conclusion in, unchanged. Mr. Cohen seeks to debunk the idea of protest or tactical voting so as to persuade people that the only way to get a Labour Government is to vote for it. He argues that those people who are fed up with Labour and want a change, actually have no choice at all. They must vote tactically he says, to get the very result they do not want. His problem lies in his assumption that the Tories are ahead and may win. Now that is perfectly possible of course, but it is not reflected in the polls nor in the application of those polls on a regional or constituency basis, where the voting arithmetic requires a substantial Tory lead just to deprive Labour of a majority. Nobody is saying that Labour cannot lose, only that it is too early to say and that the swings required would be seismic. As I have said earlier, differential turnout will be a key factor in the result. In many seats, that's true. If the Lib Dems are in second place to a Tory, it would be mad for any civilised person who is sickened by Howard's hard right stunts to do anything other than vote for them. After Iraq, there will also be straight Labour-Lib Dem fights in many cities and leftish voters will be free to go for the party that represents their views. He argues that in a three way marginal, or a seat that has a substantial third party vote behind a second placed Conservative there are dangers in protest voting that need to be acknowledged. He is absolutely right that the electoral system is a disgrace because it can create moral dilemmas for people who wish to vote with their conscience, but his conclusion that "we're stuck with the system we've got, and I'm afraid that the rather obvious point about it is that it won't give you a Labour government unless you vote Labour." is just nonsense in the context of the sophisticated argument that has gone before it. It is self-evident that the consequences of any vote that you cast are different depending on where you cast it. There are many places where Labour cannot win and where a vote for a Labour Government may well produce another Conservative MP. There are also seats where Labour are threatened by another party of the left, in which it is right that you exercise your prerogative to punish Labour for their abandonment of principle by giving that party a chance, with no danger whatsoever that the Tories could win in that seat. Ultimately, however the solution is to vote for the party which most closely reflects your own views in terms of their policies and their critique of the Government. Tactical voting does have its place but it only works on a constituency by constituency basis and, no matter how much Nick Cohen, Peter Hain and others argue to the contrary, cannot be exercised nationally so as to put the Tories into Government. A General Election campaign has not properly started unless I have spent some time leafletting or knocking on doors in the southern part of the lovely Brecon and Radborshire constituency. Thus it was that on Friday night I found myself delivering leaflets in the village of Coelbren, apparently situated on one of the highest populated areas of the constituency. Its isolation is underlined by a google search which shows that the nearest ten places to eat out are not in the village at all but in Aberdare, Seven Sisters, Glynneath and Ystradgynlais. Nevertheless it must be a lovely place to live. For some reason I was completely unprepared for the weather. I live in the City and do not expect to be engulfed in a snow storm in April, but that is what happened. Although I spent Saturday leafletting vigorously in Swansea West and Swansea East I have still not warmed up. Liberal Democrat campaign headquarters proved that they were on the ball with their latest mailshot. Normally, candidates and agents will get briefings, campaign material or assorted computer programmes through the post. Coming back from Coelbren however, I found an intriquing parcel that promised to be something different. It was a jiffy bag labelled "only to be opened in an emergency". Taking my near hypothermia to be such an emergency, I opened it. Inside was a simple three point message: "Don't panic! In an emergency (1) Take a deep breath; (2) Eat chocolate (3) phone this number..." Attached was a bar of chocolate wrapped in Liberal Democrat gold and party branding. Excellent! I have come to the conclusion that Robert Mugabe is on contract to the TV programme Candid Camera. He has been signed up to produce a long-running sketch for the revitalised show, whereby he appears at important events such as state funerals, weddings and official visits and then insists on shaking the hand of some dignitary, who in normal circumstances would not be seen within 100 miles of the obnoxious dictator. For days afterwards the news media will be full of stories about how embarrassed the victim of this particular stunt is, how he or she was put in an impossible situation, did not realise what was going on etc. At the same time a succession of obscure politicians will be wheeled out condemning the victim for his or her stupidity/naivety/insensibility (delete as appropriate). So far, Mr. Mugabe's victims have been UK Foreign Secretary, Jack Straw and the soon-to-be-married, Prince Charles. Both victims are alleged to have washed their hand immediately after the experience. Incredibly, the obscure politicians fall for it every time and immediately reach for the telephone so as to rant at the nearest journalist. In the case of Jack Straw it was Shadow foreign secretary, Michael Ancram, whilst first off the mark to condemn Prince Charles was Glenys Kinnock MEP. I am particularly puzzled as to why Glenys did not have a go at Jack Straw at the time, given her exemplary record in slating African dictatorships. Perhaps, Labour Ministers get the benefit of the doubt whereas royalty does not. It seems that Swansea University’s determination to close the Chemistry and Philosophy departments, whilst punishing dissent is backfiring on them. A group of Philosophy students have announced that they are to sue the College for breach of contract because "the cutting of university departments and the continued suspension of philosophy lecturer, Colwyn Williamson, means that they are not getting the education they were promised." With all this disciplinary action and referrals to the police, and with the Treasurer of the Swansea AUT reportedly threatened as well, it is perhaps time for the college authorities to stop digging. In the Western Mail this morning Police try to justify their stopping and searching Welsh Liberal Democrat Councillor, Ashgar Ali, by alleging that he was not wearing an appropriate ID badge. Further inquiries reveal that nobody was wearing an ID badge at the event. When challenged further the Police then said that they acted in this way because Councillor Ali was "quiet". It seems that one of the questions they were keen to ask him was why he was wearing a hat, which goes to show how well they have been trained in cultural awareness issues. On Radio Wales a senior Police Officer tried to justify the decision to pull the only Asian person out of a room of Party dignitaries and candidates and challenge his identity. All he could say was that he has a duty to protect visiting VIPs and that his officers acted appropriately. Nobody is disputing his duty and everybody at that event would have been happy to provide proof of identity and/or wear ID badges. What we cannot get away from however, is the feeling that Councillor Ali was singled out because he is a Muslim. This is the society we are now living in. I forgot to link to this wonderful post by Nick Barlow. He draws our attention to David Blunkett’s comments, in which the former Home Secretary called for urgent action on electoral fraud following the Birmingham vote-rigging scandal. It seems that Mr. Blunkett wants individual rather than household voter registration - backed up by a national ID card scheme. However, as No2ID point out "Of course, a moment’s thought reveals that ID cards wouldn’t prevent any kind of "citizen not present" fraud, such as fraudulent postal voting, precisely because the citizen and his ID card aren’t available to be verified." As Nick says, "ID Cards are a solution in search of a problem." Where Prince Charles leads, Lembit Opik follows. According to David Cornock, Lembit and Sian have also delayed their wedding. The reason they gave was that there was not enough time to carry out all the arrangements after the General Election. Charles and Camilla, of course, moved their wedding to Saturday so that the Prince could attend the Pope's funeral. One consequence of that decision is that the time of the Grand National has been put back so as not to clash. Presumably, Charles was anxious not to miss the race. The visit of Charles Kennedy to Cardiff today was not without incident. Unfortunately, the incident in question underlined better than anything I can say how Britain has taken a turn for the worst under Labour. As Charles Kennedy was undertaking a quick tour of key areas of the UK, he effectively flew into Cardiff Airport, held a press conference and then flew out again. He will be back for a more substantive visit to the City itself. He was met by a large number of Welsh Liberal Democrats candidates and activists including Caerphilly candidate and Cardiff Councillor Asghar Ali. As with all party leaders, the police were much in evidence, but only one person was stopped and challenged, Councillor Ali. As Jenny Randerson, our Welsh Party General Election Chair, said, we fully understand and support the need for security, indeed all of the party members at the airport would have been happy to have their bags searched. We are after all used to that in the Assembly, in Parliament or even at party conferences. However, what was upsetting for all those present was that of all the people attending this event just one was picked out. This seems to bear out the fears of the Muslim community that they would be unfairly singled out in the heightened atmosphere of fear of terrorism. As Councillor Ali had already been introduced to Charles Kennedy as an election candidate, it is surprising that he was still regarded with suspicion. At least one government minister had predicted that police would be singling out the Muslim community in this way. It appears that this minister's warning is starting to come true. The big danger of bringing some bigwig English politician into a Welsh constituency is that they will put their foot in it without really realising it or understanding how. So it was with Tory MP, Caroline Spelman, (who?) yesterday when she popped up in the Vale of Glamorgan to launch the campaign of my Regional colleague, Alun Cairns AM. A list of the 40 Tory general election candidates distributed by the party in Wales, shows 19 of them have homes in England. One also has a second home in Wales, taking the total of those with homes on this side of Offa's Dyke up to 22. Among the colourful list is one candidate who guarded Hitler's deputy Rudolf Hess in Spandau Prison, Berlin, another who is a trustee of an elephant charity called the Tusk Trust, and two who boast of their support for the England football team. "Plaid Cymru will always put the interests of Wales first, not Buckinghamshire, London, Croydon, Wiltshire or Essex. It is an insult to people in Wales that so many of their candidates live and work in London." Personally, I have no problem with somebody coming from across the border to stand for Parliament here. We are, after all, part of the UK and it is a UK election. What I do have a problem with is a political party trying to pretend that all their candidates are from Wales when they are not. Oh, yes, and somebody should also tell the two Tories concerned that standing in Wales whilst declaring your support for the England football team does nothing to endear you to your electors. Meanwhile, Labour have proved that they are still struggling to come to terms with the realities of devolution. Labour campaign documents sent to their Welsh candidates are reported to urge party activists to use health service promises for England that do not apply in Wales. At least they are not suggesting that Welsh Labour candidates should support England in the forthcoming Wales vs England World Cup qualifier. If the only thing to write about each day is the General Election then even I will start to get bored. Fortunately, the Welsh Assembly resumes sittings next week. No doubt Plenary Sessions will be even more lively than usual as the various parties seek to use the opportunity it presents to campaign and try to gain electoral advantage. At least things will be more straightforward for the Welsh Liberal Democrats this time around. In 2001 we were still shackled to Labour in the Partnership Government and spent most of our time agonising about what we could and could not do and say in the Chamber. Starting with the cheap shot, I notice that Tony Blair has warned of a "rather nasty rightwing campaign". I know that he means the Tories but surely his policies, particularly on law and order and asylum, and the way that he has competed with Michael Howard to reach the moral low ground must be a contributory factor to this outcome. The Western Mail leads on a challenge to the political parties and their candidates to demand real change for the NHS. They publish a pledge card, which they ask their readers to insist that political candidates sign. The pledge card carries three promises: to reduce waiting times to match England's by 2006; to create NHS walk-in centres in towns and cities in Wales; and to ensure that every patient can see a dentist in their community. In their enthusiasm the Western Mail has fallen into an old trap. People are fed up of politicians making promises that they cannot or do not keep. Much of the reason for this is that many of the promises are unrealistic or unachieveable. That is why all the parties now seek to produce properly costed manifestos and spend a considerable amount of campaigning time defending the deliverability of their pledges. Placed against this yardstick the last two points on the Western Mail pledge card are most probably achievable but reducing waiting times to match England's by 2006 is a very tall order indeed and, given the current capacity problems of the NHS, as well as the place where we are starting from, beyond the capacity of any party by that date. I am sure that we can win votes by promising to do it, but do we really want to sign up to something that we cannot deliver? If anybody believes that it can be done then please let me have your detailed plan with costings as soon as possible. Despite Labour's rather facile election slogan, Forward not Back, the electorate is neither willing to forget nor forgive the blundering invasion of Iraq based on a bogus threat of weapons of mass destruction. Iraq, according to Mr Hain, is still the elephant lurking in the electorate's living room. While the war itself will not be the determining factor for voters, (this will still be a standard tax and spend and public services battle), it is colouring the credibility of Labour's election message. The floating voters behind two landslide Labour victories have faded away, disillusioned by the slow pace of public sector reform and increasingly mistrustful of the party's promises, while core supporters still nurse a sense of betrayal over Iraq, top-up fees and creeping hospital privatisation. But there is one seat which, if lost, would give Labour cause for legitimate long-term concern - Cardiff Central. In an election where tactical voting could play as significant a role as in 1997, the strategic support of the Conservatives could combine with the disillusionment of former Labour supporters to hand this jewel to the Liberal Democrats, one year after the party captured the council. It is metropolitan, university cities like Cardiff where Labour can expect to see the biggest swings away from the party. Fury over top-up fees, frustration over the slow pace of public sector reform, a loss of trust in the Prime Minister and the ill-fated case for war will almost certainly translate into lost seats. And in Cardiff Central it requires a swing away from Labour of just 1% to hand victory to the Lib-Dem candidate Jenny Willott. With Assembly elections in 2007, a warning shot fired at New Labour now could sink Welsh Labour in just two years' time. Unless a third-term Labour Government makes good on promises from this campaign, it faces the ironic prospect of losing more power in Cardiff Bay at the very point at which the National Assembly becomes a body even more worth holding on to. AMs are not to be sidelined to allow Parliamentary Candidates to seize the moment after all. Not only is the campaign in Wales to be different because of devolution but the outcome could well settle the future of the Welsh Assembly for decades to come.